For anyone hoping to relocate to Oak Island, North Carolina, our professionals at Sloane Realty can find you some great deals on Oak Island NC real estate currently on the market. Whether you’re looking for your first home, a retirement home, or something in between like a vacation home to enjoy at your leisure, we have an assortment of properties that would superbly meet your needs. 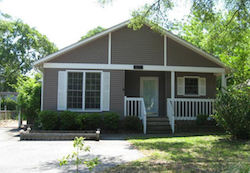 This beach cottage is located on Tranquil Harbor on Oak Island. You can just imagine what living in a place with a name like that would be like! With two bedrooms and two bathrooms it’s a manageable size for anyone. If you’re in search of a one story home, this is it! Act fast because Oak Island NC real estate never hangs around for long before someone buys it. The Pirates Are Coming Festival will be held on nearby Bald Head Island beginning at 4:30 p.m. on August 2 and run through August 4. The pirates are coming and taking over the island for several days of unbridled revelry, with proceeds benefiting the Old Baldy Foundation. Events and activities include a Pirate Invasion, Pirate Block Party, sword fights, gun powder, pirate encampments, pirate parade and pirate costume contest, pirate schools, Duck Race, Silent Auction and more! Call 910-457-7481 for more information. Another must-do event is the Port City Ribfest taking place at Cape Fear Community College in Wilmington from August 9-10, 2013. Don’t miss it!